Google’s recent announcement that they will soon be taking mobile friendliness into account when it comes to their search rankings, has been long expected. The warning to website owners that do not have a mobile friendly website is that you can expect to lose your high “Search rankings” as websites that are mobile friendly are pushed up the Search Results. You can find out if your site is mobile friendly by testing it with the mobile-friendly testing tool created by Google. It will give you a rough idea of how Google views your pages. Go and test your site now! Hopefully you got a result like the one above, if not then you need to take action now. The new Google algorithm will result in a yes or a no to the question is this page mobile friendly. There appears that there will be no grey areas. Either your site is mobile friendly or it isn’t. Google has always stated that they are about providing a quality user experience. This means that they have decided that as so many search results are made on mobile devices, it is no longer acceptable to be providing recommendations to websites that can not be easily viewed on a mobile device. For business, especially ones that get a good amount of their new business from the internet, this could prove a devastating change. Now Google has increased emphasis on mobile usability as seen in Google Webmaster tools, as well as sending warnings to webmasters who continues non-mobile friendly websites. In fact, Google sought opinion on Twitter and made a list of mobile mistakes we often see. So be sure you don’t avoid these mistakes. Unplayable content – unplayable contents can be very frustrating to mobile users. Factors that disallow videos to be played on mobile devices may be due to licensed-constrained media or requires flash media. Consider adding transcripts for the video to allow people using browsers that are unable to play quality video format. It is recommended to use HTML5 Standard animations that will provide a user-friendly experience. Faulty redirects – Configure your site’s server to redirect mobile users to the corresponding URL to your mobile site’s homepage. Mobile-only 404s – Your mobile-friendly page should not be an error page itself. Be familiar to users who visits your desktop page from their smartphones. Redirect them to an equivalent URL on your mobile site. App download interstitial – When promoting your app parallel with the content of the page, customize a simple html banner or image that will link the users to the right app store for download. Irrelevant cross-links – It’s been a common error of having links from desktop page to the mobile page, as well as mobile URL’s to link to the desktop-optimized version. Check your links if they are pointing users to the right page. Slow mobile pages – Users come to be very frustrated waiting for your content to load. Make sure your mobile site loads quickly. You can check if your mobile pages are having issues by using Google PageSpeed Isightes by focusing on the “Speed” sub section. Are you afraid of losing your site’s ranking? If so, wouldn’t you take precautions to ensure that you abide by the guidelines set by the almighty search engines? View the full guide here. Fortunately at Exposure By Design we can take away all of these hassles and create a website that will be mobile friendly, while you continue on with your business. Online businesses already have a clear picture about digital marketing. Obedience to the guidelines boosts ranking, while not following the rules can lead to total fiasco. You have no other choice but to follow every Google suggestion particularly when it comes to website optimisation. 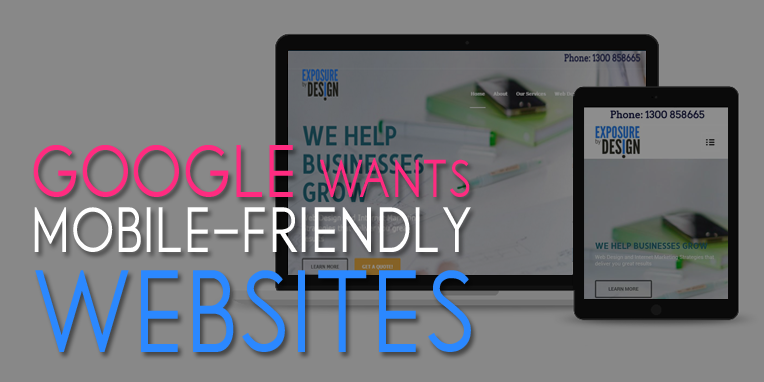 As much as rules are concerned, Google announced strict penalties for websites that are not mobile-friendly. Through the loss of search rankings. This recent update requires an immediate adoption of what we call responsive web design that allows websites to automatically fit into various screen sizes. Not taking action could mean losing your site’s visibility. It’s frightening to think that users won’t be able to recognise your very existence in the online world – the very thing you work hard for. You know the game. Visibility is the key to business success and without it, you won’t stand a chance. In the corner of mobile use, it’s inevitable that mobile devices will continue to gain more popularity since their use offers so many advantages compared to traditional desktop and laptop devices. People saw the magnificent benefits of click-and-tap-screens in accessing the internet for a valuable research. The idea of ease of access has led many to consider using mobile devices more than desktops and laptops, which resulted in the need of a mobile-friendly website. What does it mean to be a mobile friendly website anyway? 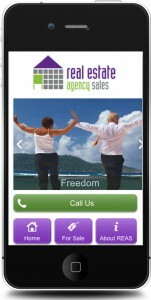 It’s not only about allowing your site be accessed via Smartphones. Moreover, you still need to consider how pleasant it presents itself to users as well as its loading speed for 3G/4G internet connections. Great user experience should be met. Don’t ignore Google’s warnings because you will surely feel the pain. The penalty for not adopting mobile websites is huge – a rank hit. Your site will fall deep below the rank page when you disregard this message. No one is exempted. As a result, for every keyword you compete for, your site won’t stand a chance against those which are mobile optimized – that’s for sure. In some cases, some websites optimized for mobile use are still not improving. This happens when designers took less notice of other important factors in web design. First is the existence of a bad video content. These videos aren’t playable on mobiles which show some errors on screens. Second is the slow loading page. Getting optimized for mobile use should still consider a fast loading speed. Third is the presence of too many pictures. It is very unlikely to post a lot of pictures on a page. Reduce the amount in order to reduce the need to load the pictures. You only have two possible options right now if you are one among those who aren’t optimized for mobile use. One, start redesigning your sites for mobile devices. And two, rebuild a new responsive site, or simply mobilize their old one. If you care about maintaining your Google ranking, then it’s time for a transformation.